Attack on Titan, The Ghost in the Shell, The Seven Deadly Sins and more … You may have seen these anime, but didja know they're all based on manga from Kodansha Comics? For one week only, we're showcasing series that were originally a manga then adapted into an anime during The All-Time Manga-to-Anime Sale! Check out the list of series that's 50% off at all our digital retail partners: BookWalker, comiXology, Google Play, iBooks, Kindle, Kobo, and nook. Sale runs through January 22! all volumes up to 50% off through January 22! Wanna know about the latest manga-to-anime series? 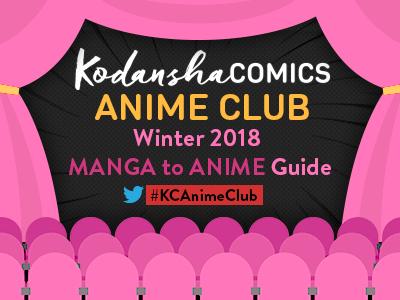 Check out the Winter 2018 Manga to Anime Guide!